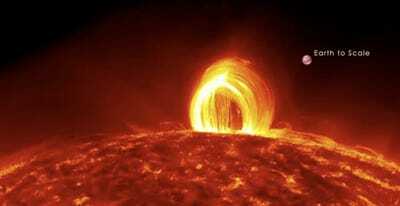 Loops of superheated plasma far larger than Earth rain down on the solar surface in a dazzling video captured by a NASA sun-watching spacecraft. NASA’s Solar Dynamics Observatory (SDO) watched as a medium-strength flare erupted from the sun on July 19, 2012. The blast also generated the enormous, shimmering plasma loops, which are an example of a phenomenon known as “coronal rain,” agency officials said. “Hot plasma in the corona [the sun’s outer atmosphere] cooled and condensed along strong magnetic fields in the region,” NASA officials wrote in a description of the four-minute video of solar plasma “rain”, which NASA released Wednesday (Feb. 20). “Magnetic fields are invisible, but the charged plasma is forced to move along the lines, showing up brightly in the extreme ultraviolet wavelength of 304 Angstroms, and outlining the fields as it slowly falls back to the solar surface,” they added. The $850 million SDO spacecraft recently marked three years in space. It launched on Feb. 11, 2010, kicking off a five-year prime mission to provide incredibly detailed views of the sun, solar flares and other space weather events. SDO has delivered thus far, capturing more than 100 million images of our star as of late last year. Some of the spacecraft’s most memorable shots over the last year are highlighted in another video, which NASA released last week to celebrate the mission’s birthday. But SDO has done more than just shine a light on the sun. The spacecraft has also helped scientists better understand comets, especially “sungrazers” like Comet Lovejoy, which survived a death dive through the sun’s corona in December 2011. And scientists used SDO to learn more about Venus’ atmosphere during the planet’s “transit” across the sun’s face, from Earth’s perspective, in June of last year. The Venus transit transfixed skywatchers and researchers around the world, as the next one won’t come until 2117. SDO isn’t the only spacecraft keeping tabs on the sun, which is currently in an active phase of its 11-year activity cycle, with a peak expected later this year. NASA’s twin Stereo probes also provide daily views of our star, as does the Solar and Heliospheric Observatory, a collaboration between NASA and the European Space Agency.